Sylvie Graf will introduce the latest findings of the „Immigrants in the Media“ project in a seminar of the Social Psychology Lab; Faculty of Social and Political Sciences. The talk named „Media shape majority’s attitudes toward immigrants: Effects of linguistic labels for ethnicity, report valence and intergroup contact“ will take place on 2 February 2018, from 10.00 in room 5799, Géopolis. Sylvie Graf will present a psychological analysis of the fear of foreigners and the role of media in shaping attitudes toward foreigners during a Psychology Update Refresher on 9 December 2017 in Zurich. 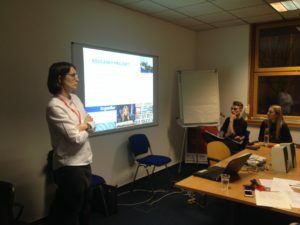 Sylvie Graf will discuss how media shape prejudice, focusing on the role of news content and language for description of immigrants, during workshop for journalists at the Czech Radio in Prague on 4. and 6. December 2017. 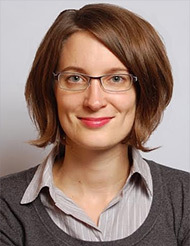 Sylvie Graf will introduce the findings of the „Immigrants in the Media“ project in a research colloquium on political communication of the Institute of Communication and Media Studies; Faculty of Business, Economics and Social Sciences. The talk named „Media shape majority’s attitudes toward immigrants“ will take place on 30 November 2017, from 14.00. 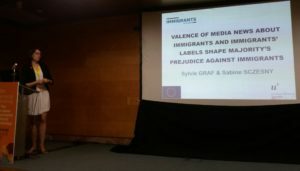 Sylvie Graf and Sabine Sczesny will present „Valence of media news about immigrants and immigrants’ labels shape majority’s attitudes toward immigrants“ in Blitz Symposium XII on Immigration, Saturday, 8 July 2017, from 11.10 in room Albéniz. Sylvie Graf will chair the Symposium on Immigration. Expert meeting on social minorities and cultural differences will be held 5. 4. 2017 from 2 pm to 5 pm at the Institute of Psychology, Czech Academy of Science in Brno.